SwRI is helping NRC develop an environmental impact statement for a proposed spent nuclear fuel and high-level radioactive waste storage facility in southeastern New Mexico. In 2018, Southwest Research Institute received a five-year renewal from the Nuclear Regulatory Commission to operate the Center for Nuclear Waste Regulatory Analyses. SwRI has hosted CNWRA®, a federally funded research and development center, for more than 30 years to support NRC’s regulatory responsibilities related to radioactive waste storage, transportation and disposal. Research and technical assistance conducted by CNWRA both draws from and further develops its broad expertise in earth science and engineering with extensive applications. Over the past seven years, we have helped NRC review license amendment requests from nuclear power plants transitioning from prescriptive to risk-informed, performance-based fire protection programs. More recently, our staff has supported NRC’s complete overhaul of the Fire Protection Significance Determination Process to incorporate experience and new fire modeling data. We also completed risk analyses of the effects of loss-of-coolant accidents and debris contamination on emergency core cooling systems in pressurized-water nuclear power plants. In addition, we completed a general evaluation of associated risks in boiling-water reactors across the United States. SwRI developed a new computational model that quantifies the pressure rise caused by a high-energy arcing fault in enclosures such as electrical cabinets used in nuclear power plants. In past years, we have used computational fluid dynamics to quantify the thermal impact from such electrical faults on nearby combustibles and equipment. In the last year, SwRI helped NRC finalize an environmental assessment of a uranium recovery project in Campbell County, Wyoming. Institute subject-matter experts analyzed possible effects on groundwater, ecology, air quality, geology, soils, public and occupational health, and cumulative impacts, among others. The Institute also helped NRC evaluate the U.S. Army’s proposed oversight and maintenance activities at Jefferson Proving Ground, a legacy military testing site near Madison, Indiana. Established in 1940 to test all types of ammunition and bombs, the site contains unexploded ordnance, increasing risks and complications to site remediation. 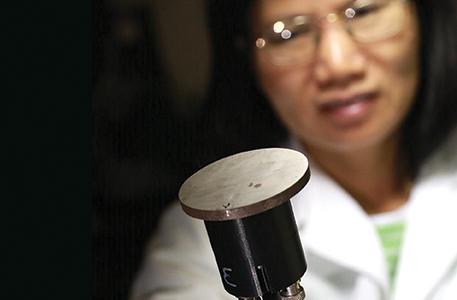 To combat corrosion in above-ground storage tanks used by the petroleum and nuclear industries, SwRI developed this prototype monitoring sensor to quickly evaluate the eﬀectiveness of various corrosion control measures. 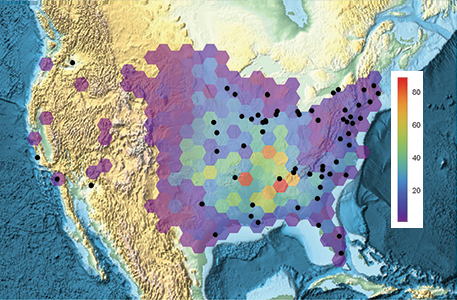 SwRI studied the risk of tornado damage to U.S. nuclear power plants (plant locations indicated by black dots on the map). The map shows the number of higher-intensity tornados inside the hexagonal regions over the last 20 years. In 2018, progress on the Next Generation Liquefaction (NGL) project culminated in a second workshop showcasing a new NGL database. Liquefaction occurs when earthquakes shake sandy, water-saturated layers that lie beneath seemingly solid terrain, causing the ground to liquefy. Developed by SwRI and UCLA with NRC funding, the database catalogs characteristics and test results from locations where seismically induced soil liquefaction has, or may have, occurred. SwRI and NRC staff members updated the Senior Seismic Hazard Analysis Committee’s guidelines, which outline a formal process eliciting expert judgments to help characterize the seismic hazards for sites around the world. The guidance incorporates lessons learned from global applications and the re-assessments of seismic hazards at nuclear power plants across the U.S. after the 2011 Fukushima Daiichi incident in Japan. For the alternative energy industry, SwRI investigated using dual-reservoir, pumped-storage hydropower to store renewable energy generated in West Texas. During peak production when energy is plentiful, water is pumped from a lower reservoir to an upper reservoir. During peak demand or low production, the water is released through turbines to produce electric power. Large, grid-scale energy storage units could bridge the gap between late-afternoon peaks in energy demand and the drop in solar energy production as the sun sets. For more information visit cnwra.swri.org or contact Executive Director Dr. Wesley Patrick via email or call +1 210 522 5158.